The Olympus Stylus SH-2 is a powerful compact digicam that offers tremendous versatility with its 24x optical zoom lens and 5-axis image stabilization. Easy and creative shooting modes get the most out of the 16-Megapixel CMOS imaging sensor, letting you just snap away. Read more in our Full Conclusion. The Stylus SH-2 is classic Olympus -- reflecting design elements from its past cameras (particularly the silver & black models), yet stuffed with the latest technologies. This point-and-shoot digicam boasts a 16-megapixel CMOS image sensor, 24x optical zoom lens (25mm-600mm equivalent), the 5-Axis Image Stabilization system out of the OM-D E-M1, RAW image capture capability, and built-in Wi-Fi for connecting compatible iOS and Android devices to transfer images, share them on social media, or even remotely control the camera. Advanced Movie Modes not only shoot Full HD 1080p videos at 60fps, but High-Speed Movie also allows users to shoot super slow motion video at 120 or 240fps. Time-Lapse Movie compresses up to five hours of action into a 20-second video. And Photo in Movie enables users to capture still images (including RAW!) while shooting 1080p video so you don't have to change modes mid-shoot. Nightscape Modes are another great feature, allowing users to creatively capture images and video in all sorts of low lighting conditions. Let's break them down. Nightscape Mode is a video mode with "gradation optimized for night scenes". Night + Portrait uses the camera's built-in flash to illuminate subjects while leaving backgrounds dark. Night Scene extends shutter speed to "capture additional light from low-light scenes for bright, vivid images, without the use of a tripod". Fireworks is not only great for shooting, wait for it, fireworks, but also for any high-contrast subjects in a dark sky. Live Composite (as seen in the OM-D EM-5 Mark II) allows you to easily and accurately create nighttime exposures over an extended period of time without the risk of over-exposure. And, finally, Hand-Held Starlight does a similar trick, but this one give users the option to shoot starscapes without a tripod -- this is thanks to the terrific 5-Axis Images Stabilization system that was developed for Olympus flagship ILC, the OM-D E-M1. 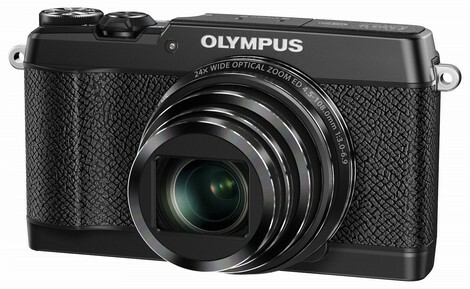 The Olympus Stylus SH-2 is available in black or silver/black with a $399.99 MSRP. See our best price box at the top right of this page to see the most current pricing online.